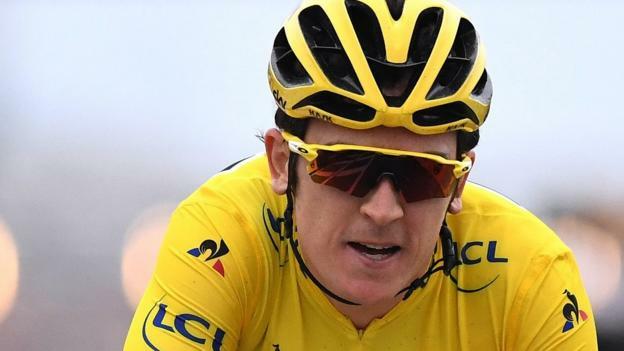 Geraint Thomas will miss May’s Giro d’Italia to be “in the best shape possible” for July’s Tour de France. Last year Thomas became the third Briton to win the Tour, following four victories by Team Sky team-mate Chris Froome and Bradley Wiggins’ 2012 win. “The Giro feels like unfinished business and I wanted to think about that,” said Thomas, who crashed while in second place at the 2017 race. Thomas and Froome said they would not race in Italy when unveiling their 2019 plans last month. Froome, the 2018 Giro winner, told Italian newspaper Corriere della Sera that the 2019 course would suit Thomas but the Welshman said: “I did not want to jeopardise the chances of the Tour for anything this year. The Giro – the first of the year’s three Grand Tours – runs from 11 May to 2 June, and the Tour from 6-28 July. Thomas begins his 2019 season in the five-stage Volta a la Comunitat Valenciana in southern Spain from Wednesday, 6 February. It will be his first race since the Tour of Britain last September. The 32-year-old is also targeting success at the Road World Championships time trial in September in Yorkshire and the Tokyo 2020 Olympics after winning gold medals on the track in the team pursuit squads at the Beijing 2008 and London 2012 Games. “I still have some big goals and targets to get me out of bed in the morning,” added Thomas. The Team Sky set-up will cease to exist at the end of this year with Sky ending its sponsorship of the team. Since 2010 the team has won the Tour de France six times, through Thomas, Wiggins and Froome. “We just have to concentrate on riding our bikes but we have every faith we should be able to find another sponsor,” said Thomas.